Our Old Miners Cottage: Chook watch! The chooks spent today settling in. At first, only one was brave enough to explore outside, but by the end of the day, all the chooks were outside scratching around. This was taken this morning..
and this is the brave chook! No eggs yet, not surprisingly! It's dusk now, and their considering heading to bed. It'll be interesting to see if they roost tonight. Yea! The Chooks are home. They look great even for try out hens. 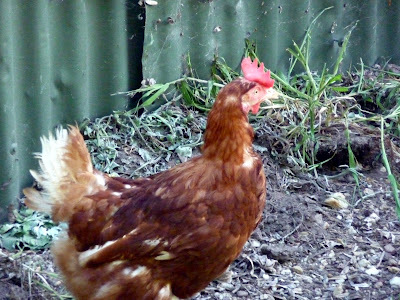 I think you did a great job on the chook pen too. Hello Manda and Marty. Love your blog.